They say necessity is the mother of invention, and I have to agree. While I love my Oculus go, it’s battery life has always been a bit of a problem. Every once in a while I would want to stay immersed but just didn’t have the juice, and I didn’t want to tether myself to a cable. Luckily I have FuelRods, the portable and swappable energy system. I discovered FuelRods at San Diego Comic Con and have been a fan ever since. For those that don’t know FuelRods are the a reusable, portable charging system that allows you to charge your mobile device on the go, and then recharge or swap for a fresh one. The starter pack comes with a short cable with micro USB with adapters for apple 32 pin and lightning connectors. You can charge your devices, and when you need more power you can swap for a new one at a kiosk. The form factor isn’t new, I own a few cells just like them, but it’s the swappable nature that makes them totally awesome. I don’t make any trip to SDCC or Disneyland without them. And when you don’t have a kiosk handy (there’s none in my town, or anywhere even close) you can charge them yourself simply by turning the cable around and plugging into any available USB part. This is how they get used most often between trips to nerd mecca and the happiest place on earth. So I have a few FuelRods here at the house and I don’t want to be tethered so why not use one of them. Smash cut to me in bed watching YouTube videos with a FuelRod dangling from my visor. It’s working, but not terribly comfortable or practical. And it can’t be doing the cable any favors supporting a dangling battery. So I tucked it under the strap, which sorta worked but the cable was just a tiny bit too short and it really didn’t want to stay there. So I thought, “I wish there was a little bracket I could attach these to….” then it dawned on me that I have a 3D printer and decent Fusion 360 knowledge (or at least the patience to bumble my way through it). Time to make myself some clips. So the next day on my Twitch live stream I set about designing the clips. After making a quick sketch to visualize what they needed to be I fired up Fusion 360. I measured the FuelRod and the strap mount of the visor and guesstimated the distance they needed to be apart and set about doing a sketch. It’s mostly a bunch of circles and constraints, with plenty of dimensions to make it easier to iterate the design. I always anticipate making changes to a design, it really never works the first time so why not make it easier on future me. Once I was satisfied with the sketch I extruded the profile, added some filets and it was a thing. 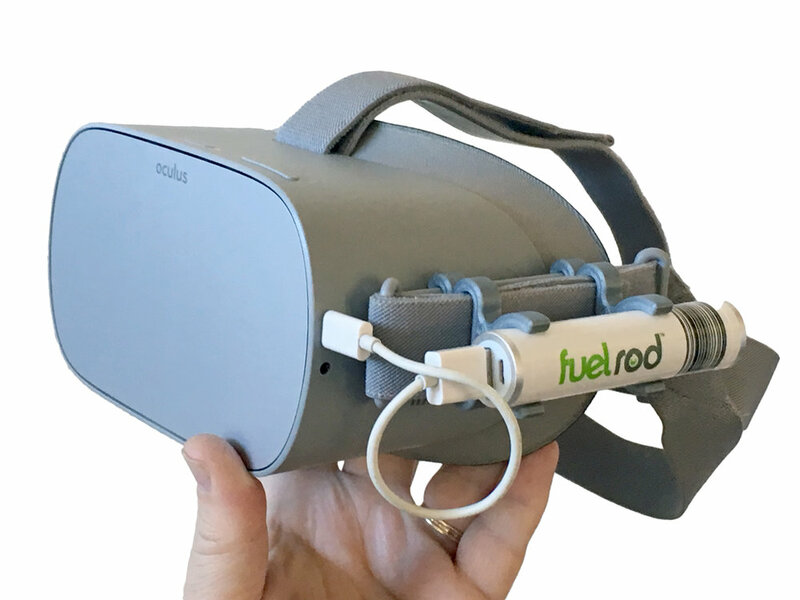 At the suggestion of my friend James of Spastik Chuwawa it was dubbed the “FuelGo” (FuelRod + Oculus go, get it? Yeah, it’s dumb). so I stamped the name on the side for the heck of it. With first draft of the design done I exported an STL and kicked off a print on my Prusa i3 Mk3. To my utter shock it worked pretty well the first time around. I snapped the clips on and attached the FuelRod, connected the cable and I was in business. I decided to play test it to see where there was room for improvement. That night I used it for over two hours and I wore out before the battery did. When I decided it was time to get some sleep the battery was still at 100%! I did notice that the FuelRod was just a little loose in the clips, it could slide with a little effort, and the clips held it on pretty well, but I thought it could use just a little more purchase, a simple fix of reducing the diameter and changing the angles of the intersection, all existing dimensions. I also thought the straps were a bit bunched up in the clip, especially where the straps are doubled. Another pretty simple fix, just make the diameter a little bigger, making it larger in both directions. I did have to fight with Fusion to get the fillets after extrusion. I have no idea why but it absolutely refused to add one to the bottom of the clip. After trying several times to make it happy to no avail, I worked around the problem by simply extruding to half the height, adding the fillet and then mirroring the whole thing. I printed a new set and they work perfectly, yay me. Happy with my new clips I shared them on Facebook. Amusingly I was immediately told I need to take down the post and patent them. Well, that’s not how I roll, but all the comments sure made me happy, and perhaps they were right, these could be marketable. I thought maybe I’d open an Etsy store, then I realized that Squarespace has an entire commerce side I’ve never experimented with, why not give it a go? So dear readers you’ll notice there’s a new link at the top of the page, the Nerds&Makers Store. And there’s a single product in there, the FuelGo clips. I’m also happy to report that I’ve actually made a sale, perhaps there’s something to this! I have other ideas too, so look for more products in the future.